Refresh, Relax, Sun, Sand, Sounds of the Surf -Summer Paradise! DESTIN-ATION FUN, SUN and FISHING HEAVEN!!! We invite you to indulge in our “Piece of Paradise” that we call SEASIDE SERENITY. Our townhome is located just 65 yards from the breathtaking emerald green waters of the Gulf of Mexico and 15 yards from a heated pool and kiddy pool. Imagine no streets to cross or no elevators to negotiate and being able to park by your very own front door. Located in SOUTHBAY BY THE GULF, one of Destin’s most sought after, ocean front, family friendly resorts. Our 2 story 1300 sq. ft. townhouse has 3 bedrooms and 2 and 1/2 baths. It sleeps 8 people comfortably. It has been beautifully decorated to capture the charm and vibrant colors of the Caribbean. Take the opportunity to enjoy the enchantment of coastal living at its finest! Front door has keyless front entry. MASTER BEDROOM: features a KING SIZE BED with two night stands, lamps, dresser, full private bath with bathtub/shower, walk in closet, ceiling fan, and 32" flat screen cable TV with remote. SECOND BEDROOM: features a QUEEN SIZE BED, large closet, night stand with lamp, ceiling fan, 32" flat screen cable TV with remote. THIRD BEDROOM: features a BUNK BED with a FULL SIZE LOWER BUNK and a SINGLE SIZE UPPER BUNK. This kid friendly room also has a night stand, lamp, seahorse night light, closet, ceiling fan, 32" flat screen cable TV with remote. UPSTAIRS BATH: The second and third bedrooms share a full sized bath with bathtub/shower. FIRST FLOOR: You will enjoy the convenience of parking in 2 reserved parking spaces just steps from your front door. Step through the front door onto an inviting FOYER. Off of the foyer is a front closet, 1/2 BATH and a LAUNDRY area that has a full size WASHER and DRIER. FAMILY ROOM: Relax in a large sectional corner sofa that seats 6, an oversized chair and ottoman that seats 2, enjoy the 42” flat screen cable TV, and complementary high speed wireless internet. The sofa opens up into a QUEEN SIZE BED, sheets and pillows are provided. PATIO: Open the French doors and step from the family room onto a PRIVATE PATIO and GARDEN area complete with orange and lime trees. You can take in the ocean breezes and enjoy the gas grill, table and chairs with shade umbrella that seats 6 and outside storage closet packed full of beach chairs, beach umbrellas, beach cart, and beach and pool toys for your enjoyment. Our “home-away-from-home” offers all of the comforts you could ever wish for such as a fully equipped kitchen with ceramic tile floors for that “at home” convenience. Other amenities include central heating and air conditioning, high speed wireless internet, 4 flat screen TV’s, microwave, dishwasher, refrigerator freezer with filtered water and icemaker, coffeemaker, toaster, crockpot, blender, electric griddle, gas grill, pack-n-play (Please bring your own crib sheet and blanket), 3 booster seats, bath and kitchen towels, linens, pillows, extra blankets, a full size washer and drier, beach chairs, umbrellas, beach cart and numerous beach and pool toys. There is even an air fill station available on the pool deck for inflatables. During your visit, enjoy the quaint peacefulness of Southbay by the Gulf’s colorful landscaping, enticing beachfront gazebo, 300 ft. of private beach, 2 adult and 2 kiddy pools, 2 lit tennis courts, and 5 acre freshwater lake with walking bridge, 2 lakefront gazebo’s, and lit fountains. Bring your fishing poles! the lake is stocked for fishing, catch and release only. Children will enjoy feeding the lake’s many ducks, turtles and birds from the bridge and gazebos. Our townhome is located within walking distance of Destin Harbor, La Paz, Mellow Mushroom, Sunsations beach store and many other popular shops and restaurants. It is a 5 min. drive to Winn Dixie, Super Wal-Mart, Target, The Big Kahuna water park, The Track amusement park, Destin Commons, The Doughnut Hole, Fud Puckers (feed live aligators), The Back Porch and other restaurants and attractions within the heart of Destin. Sandestin’s The Village of Baytowne Wharf, and Silver Sands outlet mall is within a 15 min. drive. There is a restaurant and attraction guide available at the townhouse, complete with menu's of area restaurants and shopping maps and sports brochures, to help you choose between the many restaurants and attractions available. Hello! My name is Diane and I have been the owner/manager of a beautiful townhouse that we call ‘Seaside Serenity’ since 2004. In my full time job, I work with teens in a high school setting who have emotional and behavior disorders. My hobbies include oil painting and working with props for local stage productions. We are marching band and color guard enthusiasts. Especially, The University of Georgia Redcoats, and Atlanta Corps Vets. When we want to get away and have some family time, we head to the BEACH! We swim in the ocean, build sand castles, ride bicycles, visit unique shops, grill out on the patio, bake fresh cookies, and take long walks on the beach. The thing I love the best about owning rental property is the wonderful guests and neighbors that I have gotten to know over the years. People that I otherwise would not have met. We are very fortunate to have a large number of repeat guests. My husband and I have been snorkeling and scuba diving for many years. We also enjoy swimming and shell collecting as a family. Our favorite place to vacation was the caribbean. When we moved to the Atlanta area from Orlando, we discovered that the beaches of Destin were as beautiful as the caribbean and an easy drive from the Atlanta area. We have been vacationing in Destin since 2003. Coming to Destin is now a family tradition with many great photo's and memories. We insisted that our property be in a very family oriented development. We fell in love with Southbay as it captures the charm of old Florida and our condominium has the feel of a cottage, not a hotel room. 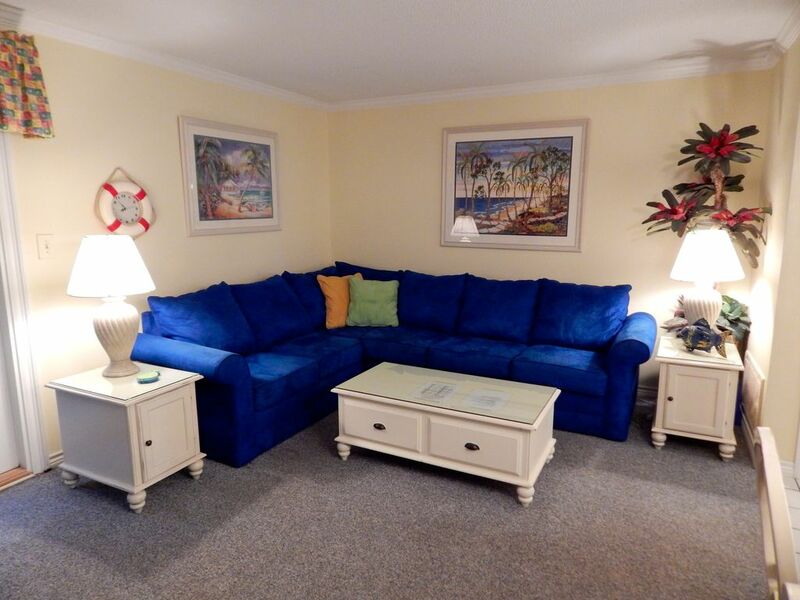 Guests comment on how 'relaxed and at home' they feel at Seaside Serenity. We enjoy having a private beach and pool less than two minutes from our doorstep. Southbay is one of a few properties that still has a 1 foot deep kiddy pool. A private patio to grill delicious family dinners and a small garden in which to putter. I have planted an orange and lime tree in the back yard. We can hear the ocean from our doorstep and enjoy watching pods of dolphins from the beach. Our development is quiet and tucked back by the ocean, yet we can be at any restaurant or at great shopping in 10 minutes or less. There are no house phones available. Guest must use their personal cell phones. There are two designated parking places in front of the townhouse. Parking passes provided and must be displayed at all times while on property. There is high speed wireless internet available. Bath and kitchen towels provided. Bring your own beach towel. Open to the dining area. Large sectional sofa that seats 5 and a large over sized chair and ottoman. Brand New in 2017, filtered water and ice in the door, ice maker in freezer. - removes impurities and that "Florida water taste"
Two coffee makers are available in the kitchen. A traditional coffee maker with filters and a Keurig coffee maker, so bring your k-cups if you have them.. The dining area opens up and is adjoining the main sitting room. The table seats 6 people. There are two booster seats available. The booster seats are the style that sit in a chair. There are four smart flat screen TV's. There is a 42" in the main sitting room and each bedroom has a 32". The Upgraded Cable TV package offers something for everyone. Upgraded cable package for your enjoyment. A few table top board games for time spent out of the sun. All the equipment needed to make the sandcastle of your dreams. Step outside the backdoor onto a cement patio with garden view. There is a table with umbrella that seats six. There are two lit tennis courts available on property. Bring your own rackets and balls. Just 25 yards from the front door. (2) There are two large pools and two large kiddie pools on property. The South Side Pool consists of one large pool 4' to 7' deep and one kiddie pool 1' deep, both heated January through May. A large variety of Pool and Sand Toys are available to guests, as well as beach chairs and two umbrella's. There is an air fill station available for inflatable water toys. There is a five acre fresh water fishing lake on property (catch and release only). Children will enjoy feeding the ducks, fish and turtles from the walking bridge. Destin is our favorite vacation place! The condo was perfect and had everything we needed for the beach,won’t have to pack so much next time it was already there for us to use. The condo was so close to everything we wanted to go do and see. Made so many wonderful memories and can’t wait to visit again! Everything was great! We were very happy with the condo. Little issue with dryer but nothing big. Loved being so close to the pool and beach. Close to grocery store and so many restaurants. We had a wonderful stay at SouthBay! We had beautiful weather for our week in Destin and enjoyed both the beach and the pool every day. The pool was so close to the condo and the beach was also a very short walk. The condo was exactly what we needed for two families and 2 little children. The condo was very well stocked with everything needed for a week away from home. Thanks for allowing us to spend our time in Destin and helping us to have such a wonderful vacation!! Very comfortable and well stocked. Very short walk to the beach and pool loved the baby/toddler pool. Over all the stay was wonderful. The condo was perfect for our needs. Our family enjoyed the stay and will come again nest year. Thank you. We've been coming to Southbay By the Gulf for about 15 years, and, have stayed in many different units. Seaside Serenity, Unit 95, has been the greatest, for us as a family! We have finally found our niche. We stayed here last year and are now on our way home for this year. We love the furnishings, the bedrooms, mattresses, pillows, and how they are all decorated. The beach chairs, umbrellas, and the wagon, were awesome and saved us quite a bit of money! Being next door to the big pool and a short walk to the beach was wonderful! I'm already looking forward to next years stay! You have an awesome place, Diane!! Dolphin Tours, Sunset Cruises, Dinner Cruises, Water Park, Amusement Park, Beachcombing, and Breathtaking Sunsets. Rates are subject to change until your reservation is confirmed. Please note that the security deposit is a separate fee in addition to the rental fee, tax and cleaning fee. The security deposit will be fully refunded two weeks after your check out date upon satisfactory condition of the townhouse at check out.